Over the past few years my skin has changed a lot. Between pregnancies and just getting older in general, I can see and feel a difference in my skin. The makeup I had been using for years was becoming problematic – it just wasn’t compatible with my skin anymore. I decided a while ago that I needed to make a change in my makeup and have been trying a few different types and brands to try to find a good fit. I haven’t had much luck with traditional foundations, so when the opportunity to try a pressed mineral foundation from L’eclisse arose, I was excited to see if this was the answer my skin had been waiting for! Ordering foundation online can be a little tricky, but L’elisse made it easy with their Foundation Shade Selection Chart. I was able to figure out my perfect shade by choosing my skin undertone and intensity. 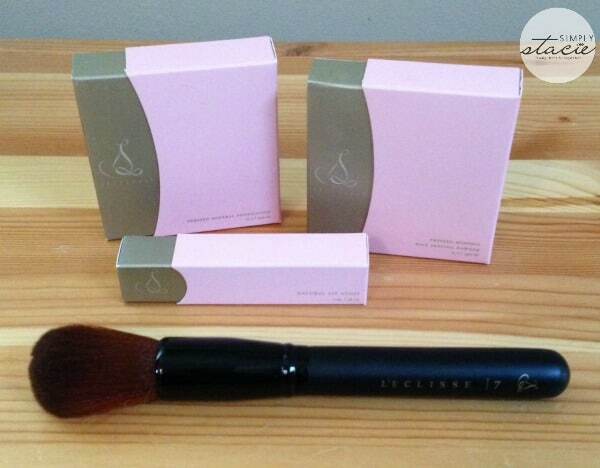 In addition to the pressed mineral foundation, I was able to choose a pressed mineral setting powder in Transparent Light, a natural lip gloss in Rose Quartz, and a large Buki foundation brush for review. When the items arrived I was immediately impressed with the pretty packaging – very elegant and girly. Living in a house full of boys I don’t have a lot of girly items around! The foundation is a perfect fit for my skin tone and it literally glides on to my skin with the foundation brush (which happens to be the thickest, softest, most luxurious brush I’ve ever felt). After I was done the foundation powder, I finished off with a dusting of the setting powder. What’s fantastic about this setting powder is its staying power – it literally lasts all day (I don”t have to “freshen up” during the day). I love how this makeup makes my skin feel and look. The lip gloss gives my lips a nice subtle sheen and I love that it’s not sticky as some glosses tend to be. I’m very impressed by this line of makeup, and I’m a new convert to pressed mineral makeup! The pressed mineral foundation is free of oil, talc, and synthetic dyes and comes in a range of 9 shades. It sells for $57 on the L’eclisse site. 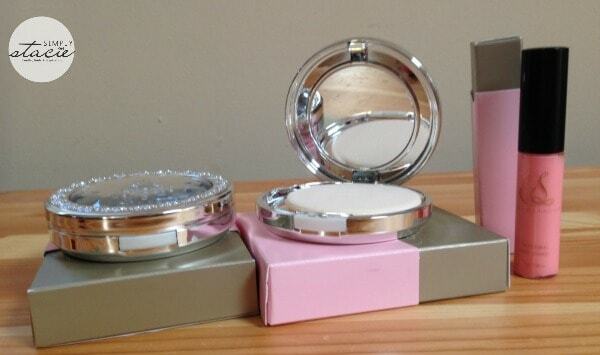 The setting powder is also free of oil, talc, and dyes and is available in 3 shades. It sells for $42. 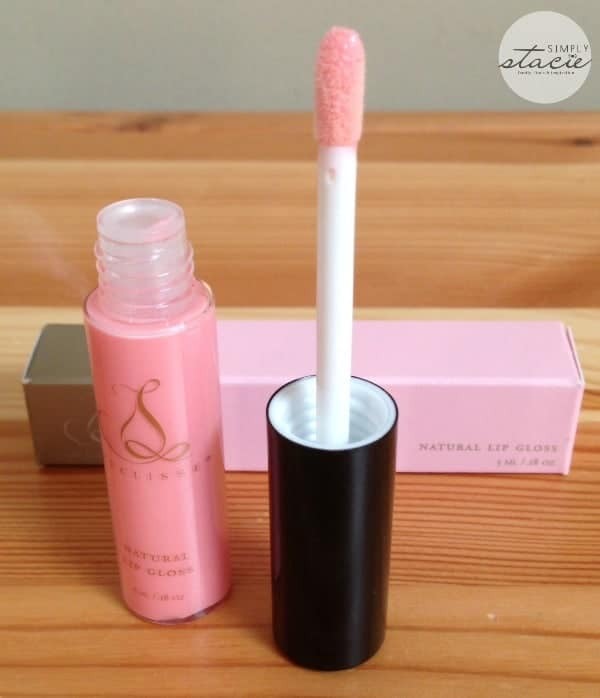 The lip gloss incorporates an all-natural blend of certified organic ingredients to hydrate and protect lips. There are 10 shades available that sell for $19 each. L’eclisse is a company committed to helping you look your best by using the most natural and safe ingredients they can source. They never use synthetic perfumes, oils, dyes or fillers in their products. Their non-comedogenic, oil-free formula is ideal even for the most sensitive skin (which mine definitely is!). Their skin-care line’s formulations include natural botanicals, vitamins, peptides, essential oils, and when possible, they use Certified Organic ingredients. To see the full line of cosmetics and skin care that L’eclisse has to offer, visit their website. You can also find them on Facebook, Twitter, Pinterest, Instagram, and YouTube. I would love to try the All Natural Pressed Mineral Setting Powder. I would love to try the Mineral blush! Love the colors available in the Natural Lip Gloss! I would love to try their Rich & Gentle Rose Hip Cleansing Foam!